It's another major change for the U.S. airline industry, as two popular regional carriers merge. For months, Republic Airways Holdings (RJET) has had a decision hanging over it regarding its two commercial carriers: Denver-based Frontier Airlines and Milwaukee's Midwest. Republic purchased financially struggling Midwest in July 2009 and bought Frontier out of bankruptcy protection last October. At the time, Republic executives said they planned to operate Midwest and Frontier as partners, with the understanding they would eventually be melded into one. Republic held simultaneous press conferences in Denver and Milwaukee on Tuesday. Ian Arthur, Republic's Vice President of Marketing and Branding, announced the carriers' unified brand name. "That brand...is Frontier," he said . The news was met with wild applause, cheering and even some tears of relief from several hundred Frontier employees assembled for the Denver press conference. "It's fantastic," said Florene Kershman, who works reservations for Frontier. "We've been praying for it from the beginning." Joseph Gonzales, a Frontier flight attendant for nine years, believes the two carriers will mesh well. Midwest, he says, is "real customer-oriented, like we are, a friendly atmosphere there, so I'm looking forward to seeing what will happen." Republic says the decision was made following an independent survey of 10,000 customers or potential customers, as well as an online employee poll. While both airlines' emphasis on service were considered an important part of the equation, "the research showed that Frontier, with four times the customer base, is better positioned to appeal to Midwest brand loyalists." The integration of the carriers won't be completed until next year, but Frontier passengers are expected to start seeing some major changes soon. Frontier will add 15 new markets: 10 new destinations out of Denver and five from its Milwaukee hub, starting this summer. "As a result," says a news release, "the carrier will grow by 7% in seat miles this year, three times the industry average." The new, re-branded Frontier currently employs more than 5,700 workers -- 1,200 employees in Milwaukee and 4,100 in Denver. "It was a very considered decision," Arthur said after the Denver press event. "There was such loyalty in both hubs for both brands, but Frontier is already positioned as a low-cost carrier, had a significantly larger customer base, and so it was pretty obvious that we should be moving forward with a brand that was already associated with what today's...flying public is looking for." Analysts say the Frontier-Midwest re-branding, along with the proposed merger of U.S. Airways (LCC) and United Airlines (UAUA), is just another sign of the times for the airline industry -- as low-cost carriers grow and the so-called legacy airlines continue to struggle. "There's an ongoing trend of consolidation in the industry, being driven by the incredibly poor financial standing of most airlines in the past 10 years," says Professor Andrew Goetz, chairman of the University of Denver's Geography Department and a Research Associate at the National Center for Intermodal Transportation. "Airlines see it as the strategy they have to pursue in order to survive." Goetz says that while Frontier employees in Denver might feel like they have won, the re-branding is not a guarantee of success. He pointed to the competition Frontier still has from Southwest (LUV) and other low-cost carriers, especially at Denver International Airport. "There's no major winner here," he says. "Frontier still faces some daunting challenges." 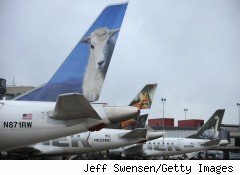 In the meantime, Republic officials promise their unified brand will retain favorite features from both airlines -- including Midwest's fresh-baked chocolate chip cookies and Frontier's popular "spokesanimals," which appear on the tail of all Frontier planes.